Inspired by French financiers, these small cakes are dense with the warm flavors of almond, orange zest, and butter. 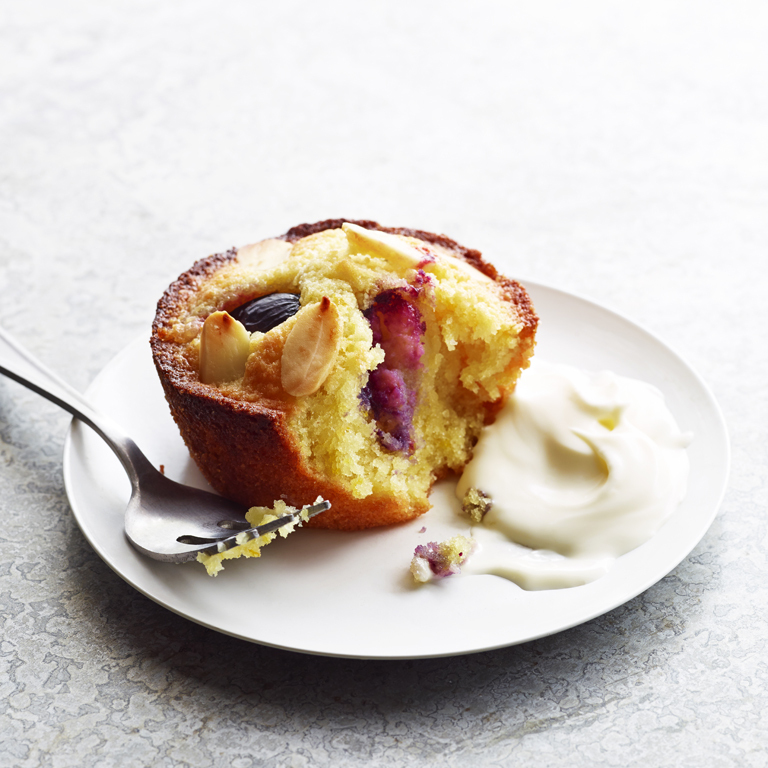 The grapes become a little jammy after baking, which complements the cakes' richness. Preheat oven to 400°. Generously butter and flour 9 cups (1/3-cup size) in a muffin pan (if possible, use a shiny rather than a dark pan). In a bowl with a mixer, beat butter and sugar until thoroughly combined and light. Add eggs and beat until incorporated, stopping to scrape down inside of bowl. Add almond and all-purpose flours, orange zest, vanilla, and salt and beat on low speed to combine. Divide batter among prepared muffin cups. Poke 1 grape into batter in each cup. Cut remaining grapes in half lengthwise; set 2 halves on batter in each cup. Sprinkle with sliced almonds. Bake until deep golden brown, 20 to 22 minutes, rotating pan halfway through. Let cool in pan on a rack at least 15 minutes. Loosen cakes from pan with a knife, set on small plates, and serve with a spoonful of crème fraîche if you like.